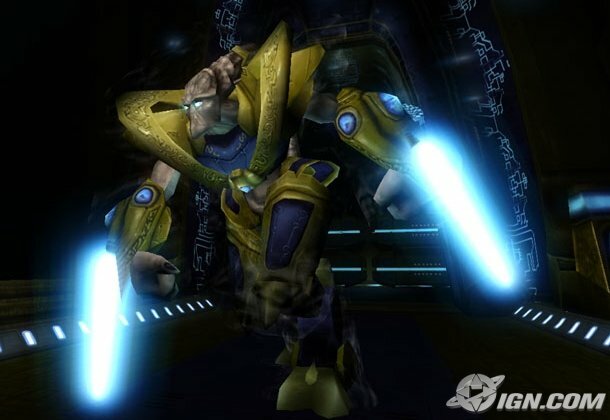 The basic Protoss powered infantry unit is the Zealot, armed with either twin Psi-Blade Gauntlets or a Psi-Glaive. Closely related is the Vindicator, armed with a Portable Phase Disruptor or Photon Cannon, and the Purifier, armed with a Portable Thermal Lance. Attributes: ST 15 ; DX 14 ; IQ 12 ; HT 14 . Secondary Characteristics: Damage 1d+1/2d+1; BL 45 lbs. ; HP 20 ; Will 14 ; Per 12 ; FP 14 ; Speed 7.00 ; Move 9 . Advantages: SM +1; Combat Reflexes ; Detect (Psionic Energy; Psionic, -10%) ; Doesn't Breathe (Oxygen Absorption, -25%) ; Doesn't Eat or Drink ; Fit ; High Pain Threshold ; Mind Reading (Psionic, -10%) ; Mind Shield 2 (Psionic, -10%) ; Racial Memory (Active; Psionic, -10%) ; Telesend (Psionic, -10%) ; Unfazeable . Disadvantages: Code of Honor (Protoss) [-15]; Fanaticism (Protoss) [-15]; Mute (Mitigator, Psi-Tech, -60%) [-10]; No Sense of Taste/Smell [-5]; Sense of Duty (Protoss Tribe) [-10]; Unusual Biochemistry [-5]. • Another -25 points chosen from among Bloodlust [-10], Callous [-5], Easy to Read [-10], Hidebound [-5], Impulsiveness [-10], Incurious [-5], Intolerance (Terrans, Zerg, or Dark Protoss) [-5] or (Total) [-10], No Sense of Humor [-10], Obsession (Purge the Zerg, etc) [-10], Overconfidence [-5], Selfless [-5], Stubbornness [-5], Truthfulness [-5], or other non-crippling personal disadvantages. 1. Dual Psi-Blades: Force Sword (A) DX+2 ; Dual Weapon Attack (Force Sword) (H) Skill+0 . • The perk Off-Hand Weapon Training (Force Sword) . 2. Psi-Glaive: Force Staff (A) DX+2 ; Force Sword (A) DX+1 . • The perks Grip Mastery (Force Staff)  and Reach Mastery (Force Staff) . 3. Portable Cannon (Purifier or Vindicator): Armoury (Heavy Weapons) (A) IQ ; Force Sword (A) DX+2 ; Gunner (Beams) (E) DX+2 . Secondary Skills: Battlesuit (A) DX+2 ; Beam Weapons (Pistol) (E) DX+2 ; Climbing (A) DX ; Electronics Operation (Psychotronics) (A) IQ ; Expert Skill (Psionics) and Tactics, both (H) IQ ; Judo and Karate, both (H) DX ; Hiking and Running, both (A) HT ; Jumping (E) DX ; Mental Strength (E) Will+1 ; Mind Block (A) Will ; Spacer (E) IQ ; Throwing (A) DX . • Choose four of Armoury (Battlesuits, Heavy Weapons, or Small Arms), all (A) IQ ; Gunner (Beams) (E) DX+1 ; Piloting (Aerospace, Contragrav, or High-Performance Spacecraft), all (A) DX ; Intimidation (A) Will ; Navigation (Air, Land, Space or Hyperspace) (A) IQ ; Survival (Low/No Atmosphere or Toxic Atmosphere) (A) Per (A) ; or spend 2 points to raise one of those skills by 1 level. 2. Suit-integral Psi-Blade, and one of: Portable (Phase Disruptors, Photon Blasters, or Thermal Lance).